Whatever it is, it’s cut off the whole town. They’re trapped! 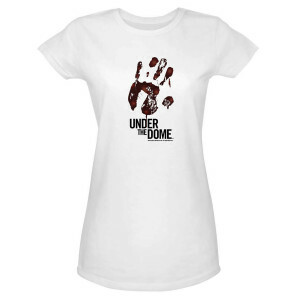 Show you’re a fan, and living outside the dome, with the Under the Dome Trapped Women’s T-Shirt. The white cotton tee features the bloody handprint left on the dome from the first episode of Under The Dome, the show based on Stephen King’s novel. Get this flattering tee and watch what can happen in the tiny town trapped in a dome.